On February 26, 1972, a coal mining dam collapsed at the head of Buffalo Creek in Logan County. Over the next three hours, 132-million gallons of black water raged down the hollow. The deluge obliterated or badly damaged 17 communities and claimed the lives of 125 people, including entire families. 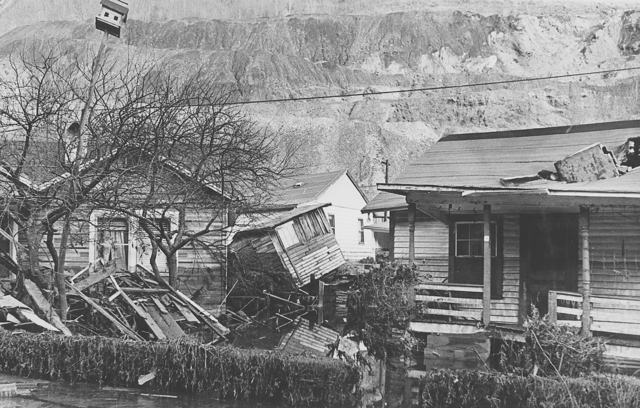 The disaster also injured 1000 people and left 80 percent of Buffalo Creek’s residents homeless. The collapsed dam was owned by a division of the Pittston Coal Company. Officials with Pittston attributed the flood to heavy rains, calling it “an act of God.” However, state and federal investigations pinned the blame squarely on Pittston, saying that company officials had “shown flagrant disregard for the safety of residents.” Survivors and the victims’ family members reached an out-of-court settlement with Pittston that averaged $13,000 per person after legal fees. West Virginia filed its own suit against the company. It was settled by Governor Arch Moore before he left office in 1977. The Buffalo Creek Flood eventually led to new state and federal laws regulating dam construction and maintenance. It remains one of the country’s worst mining-related disasters. The site of a 1972 disaster along Logan County's Buffalo Creek is having new life breathed into it. Buffalo Creek is rapidly becoming one of southern West Virginia's most popular trout streams. This week marks the 42nd anniversary of the collapse of an earthen dam along Buffalo Creek after heavy rain. It unleashed a flood that killed 125 people, injured 1,100 and left about 4,000 homeless. West Virginia's 1972 Buffalo Creek disaster is being remembered in a mural. Canadian artist Kevin Ledo began work on the mural Tuesday. His canvas is the outside brick wall of one of the few buildings in the Logan County community of Man still standing from before the flood that killed 125 people, injured 1,100 and left 4,000 homeless. The flood occurred when an earthen dam along Buffalo Creek collapsed after heavy rain, sending 132 million gallons of coal waste into the community. A. James Manchin was born in Farmington on April 7, 1927. He’d become perhaps the most colorful politician in West Virginia history. During his one term in the House of Delegates in the late ’40s, he fought for civil rights issues, which possibly led to his re-election defeat. After stepping away from government for a decade, he returned as state director of the Farm Home Administration in the ’60s. Earlier this month in West Virginia, a CSX train derailed, causing giant fireballs to stretch hundreds of feet into the air and one home to be destroyed. Investigators are trying to figure out what happened to cause this derailment. February also marks the anniversary of other industrial accidents. On this episode, we'll hear from folks who have survived them, and hear why many people are concerned that more of these accidents could happen in the future.